According to the National Academy of Engineering (NAE), the one thing that is certain about the future of engineering is its uncertainty. Yes, there will be plenty of work, but how it gets done and who actually does it is very much the question of the future of the profession. With advances in automation and the integration of technology into healthcare, communications, environmental sciences and other industries, tomorrow's engineers will need an expanded skill set beyond basic engineering principles to achieve all that the technological future appears to promise. improving learning through virtual reality. Today's headlines underscore the prescience of the 2004 engineers, and the changes in today's engineering industries reflect, in many circumstances, their evolution in response to those early theories. And, just as technology has transformed so many industries, so it is evolving the accounting field. The engineering-focused professional services automation software offered by Beyond Software is designed to track and quantify the value of the expanding suite of today’s engineering services while also being flexible enough to incorporate tomorrow's challenges. It combines financial and project accounting in one consolidated, streamlined system to increase efficiency. 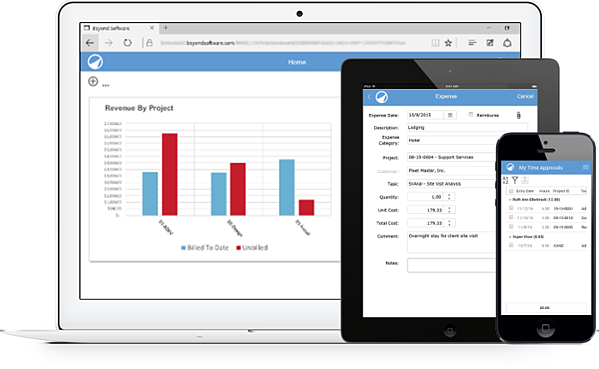 Time and expense management is easy when using the Beyond Software app, so engineers working remotely can capture their data on the go. Managing project resources is also easier; customize billing rates for employees and assign them to tasks and projects. Invoicing and billing move faster, allowing you to stay on top of cash flow. Intuitive dashboards provide reports across the top level of every project, while consoles and reports provide analysis at a more granular level. The engineering field declared its intent to lead the world into the future of technologically advanced buildings and systems. Beyond Software designed its professional services automation software to walk with the engineering industry into that future. "Beyond Software enables us to manage projects efficiently so that we can help customers optimize energy improvements across the region that improve the quality of life for our citizens."